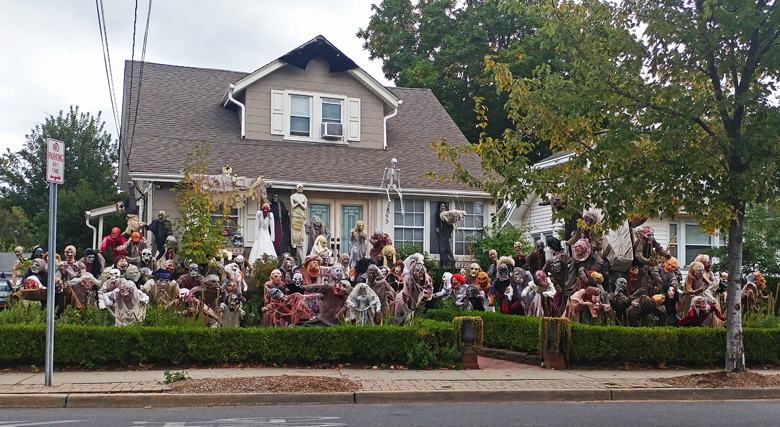 Folks here in New Jersey sure do know how to get into the Halloween spirit, and often do so with elaborate seasonal displays. 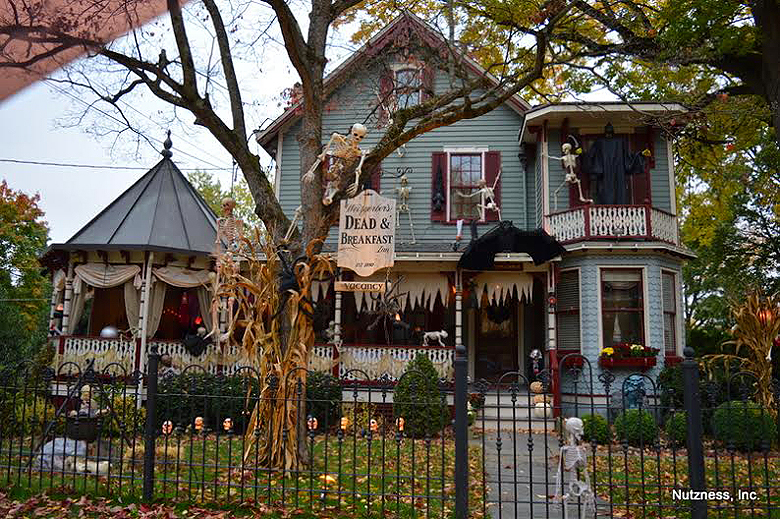 Here are just a few of our favorite properties, personalized for the holiday, from the past couple of years… Do you know of any haunted houses decorated somewhere in the state this October? If so, please write in and let us know what kind of creepy fun YOUR neighbors are up to! 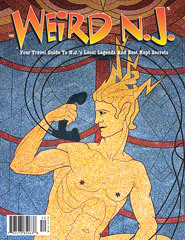 You can contact us at Editor@WeirdNJ.com. You can also add your photos to the expanding online pool of Weird NJ images by tagging us on Twitter #WeirdNJ, Instagram #WeirdNJInsta and Facebook @WeirdNJ. The 31 Skeletons of Bound Brook: A Work in Progress! Here’s an update from James about his plans for 2017: “I’ve begun the 31 Skeletons this year with an Army Of Darkness theme. I can send you some more photos once we get some more of them outside.” Thanks James, can’t wait to see what you come up with this year! You can’t miss it, but make no bones about it, it’s something you should not pass by without pivoting your skull for a second look, or more. 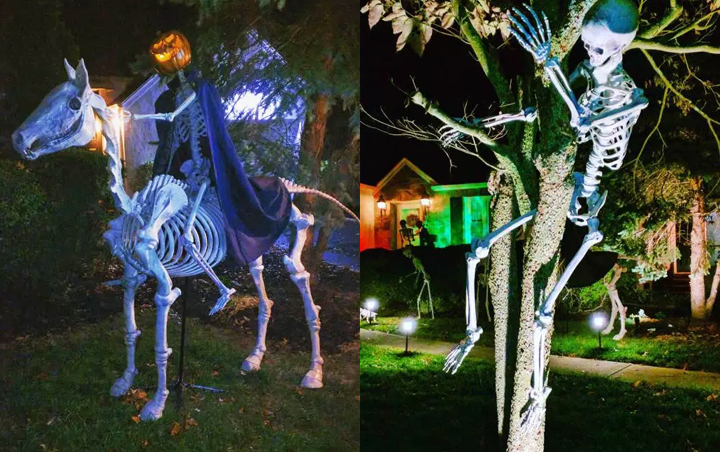 It’s The 13 Skeletons Halloween display, set out in a PG-10 manner since 2006 by the fun loving Jim Adams and his family on the front lawn of their home. A moment does not pass where a car isn’t pulling up gawking in delight at the light-hearted arrangement of skeletal remains. Those that stop to get out and see it closer all say they have been coming to se e it for years. The Skeletons work this sideshow each year, and although the theme changes from time to time, a constant is that the 13 Skeletons come out in stop action motion where the cars passing will see a different position each day or night they travel past. 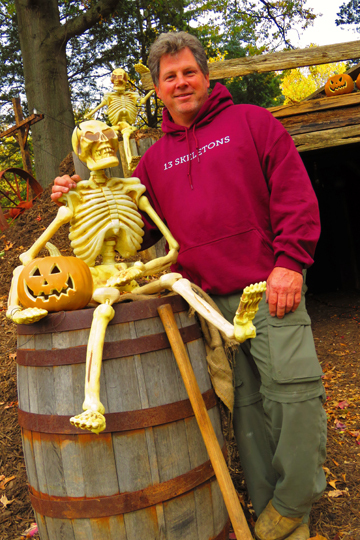 The thing that Jim seems to enjoy most about his 13 Skeletons are the people the display draws “from all walks of life and from all over,” who he loves to interact with, he says. Many visitors have a story or a joke to share, and in return Adams is a real comedian. He has an unending supply of Skeleton puns, such as the display at times is manned by a “skeleton crew.” (rimshot) One year a lady wanted one of Jim’s annual tee shirts, which he gladly obliged to give her. The next day there were three pumpkin pies sitting in the center ring of the circus themed display. Jim told me the tale of the night a skull went missing. The following day a van pulled up, a driver got out, carefully placed the skull back into its place, and sped off. Says Adams, “seeing that just made me feel good. The follow through to come back and make it right renews my faith in people.” The gift he gives NJ in return is not lost on me, what he offers in setting this up each year is a priceless treasure of childhood and seasonal memories for all. Set up with more sweat and effort than cost, it uses minimal power but yields maximum joy to both Adams and his family and of course all who come to see it. 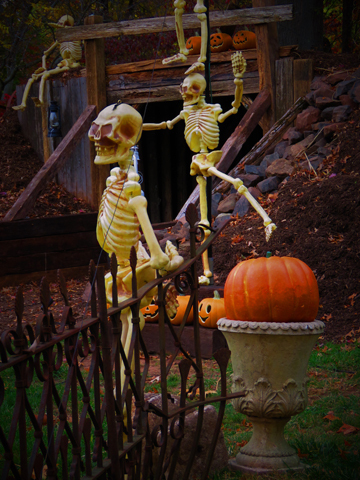 The mine theme displayed this year is constructed of 160 wooden pallets and a lot of moss, and as always, pumpkins, skeletons, and lots of fun. As Jim says, “your imagination is all you need.” For a good time and some friendly frights, I whole-heartedly agree with him. Happy Halloween everyone! Reporting for Weird NJ, I’m Rich Robinson. Just when you think you have seen it all and nothing can top it, a viable contender of weirdness will inevitably throw its bizarre brand of oddness into the mix, giving the established WEIRD a run for top banana. 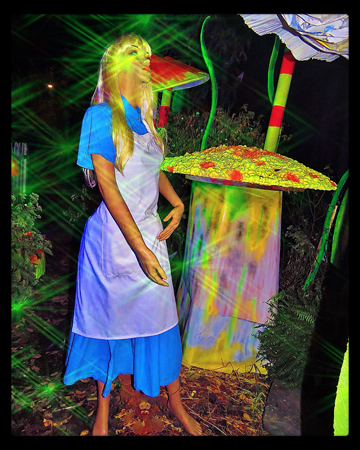 Alice in Wonderland was the theme of the annual Thompson Street Halloween effort this season in Bordentown, and it is indeed worthy of seeing––but even then you may not believe it…So, take some pictures! 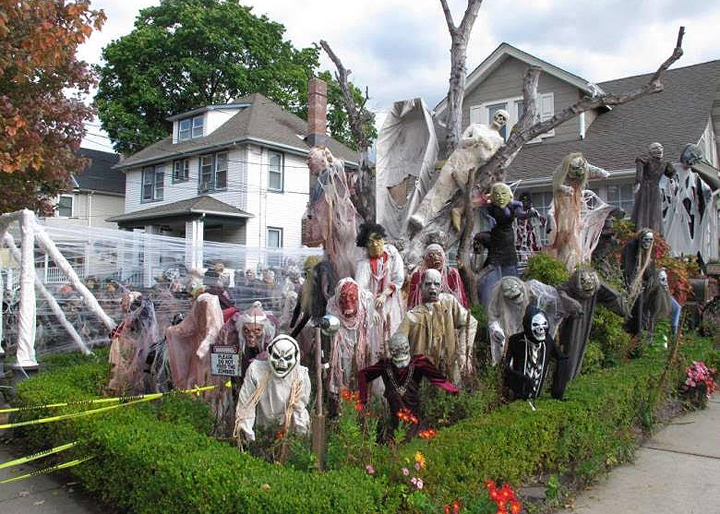 The residents of the community all get together starting in August each year and plan a theme with each home on the street participating in the season’s festivities. The one-way street begins with each home showing displays of the Alice In Wonderland theme, such as a tea service and large playing cards. It’s a block long close quarters enchanted experience, very popular to those in the know. The not to be missed massive colorful Alice In Wonderland masterpiece a few houses in is the artistry of the Frank Rios household. 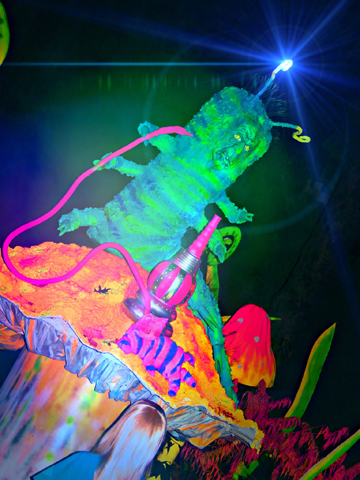 Rios has festooned the decorations with neon colored props bathed in fog and black lights with its main character, Alice, staring up intently at the Caterpillar as he soapboxes wisdom atop a psychedelic mushroom with his hookah. Astounding, in a word, incredible in another, and I could go on, but just try to see this thing, you will be glad you did. 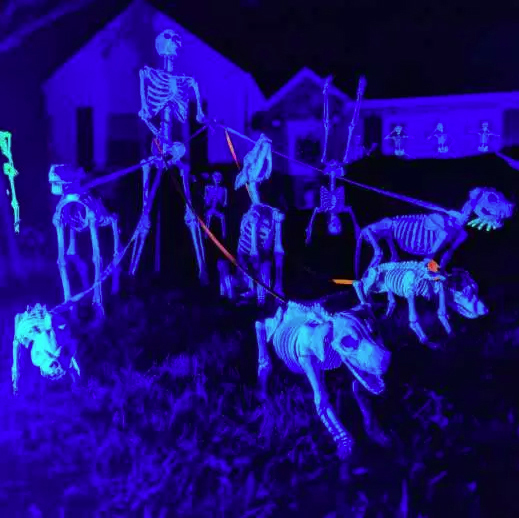 This yearly event includes the Pumpkin Man of Bordentown as the last display on the street corner where a rather large quantity of hand carved pumpkins cast a warm glow through the yard of his home. 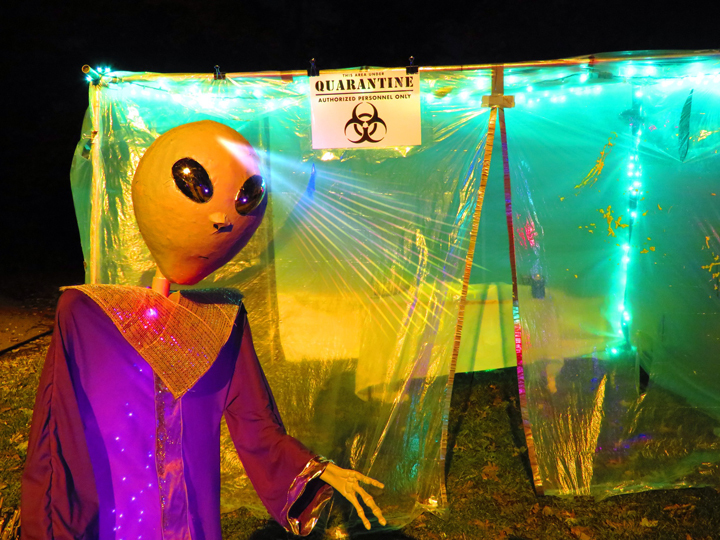 Totally inspired by the enclave over on Thompson Street, the neighbors across town on Brooks Avenue came up with a theme of their very own, working this year with several UFO craft, landing, crashing, invading and to top it all off at the “dead end” with an Alien Autopsy tent! 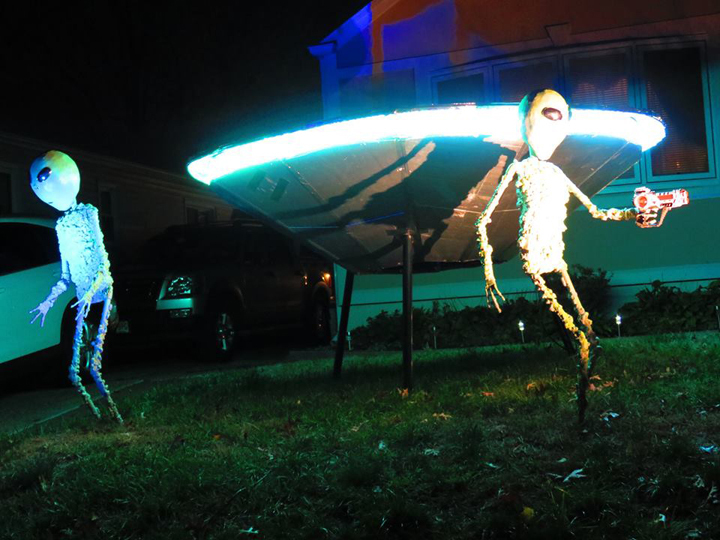 Two energetic residents of the street, Neil and Jen, outdid themselves with the UFO Crash on their front lawn. 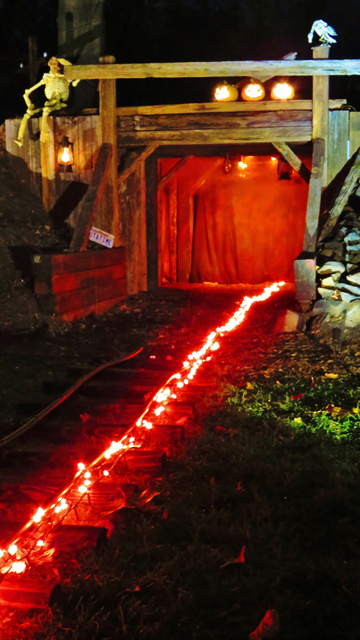 It includes a long glowing trail of embers emanating from the largely intact wreckage. There are four beings observing the crash while one appears housetop looking sternly down at the crew. 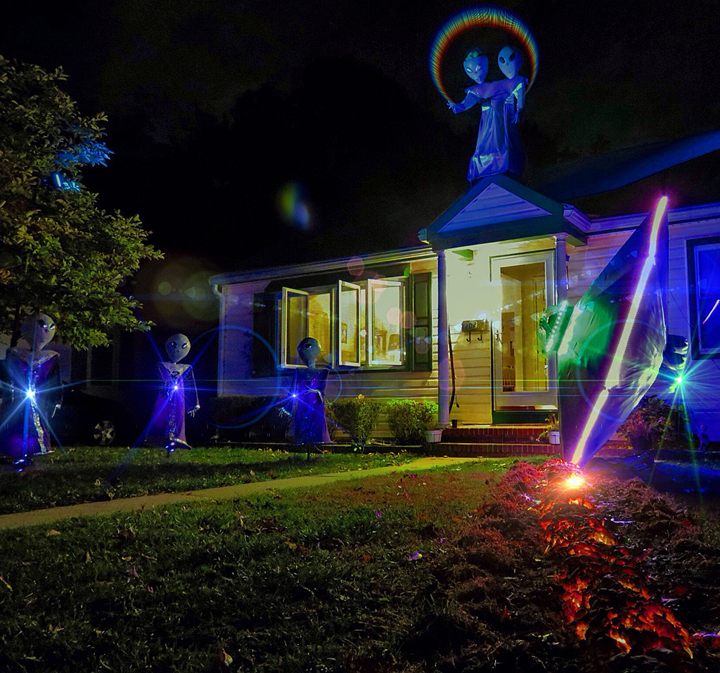 Halloween has truly been invaded by the Interstellar Travelers on Brooks Avenue this year. Many thanks and “props” go to the communal spirit that the fine people of Bordentown, NJ choose to share with all who come to enjoy it. They are all great New Jersey neighbors indeed. 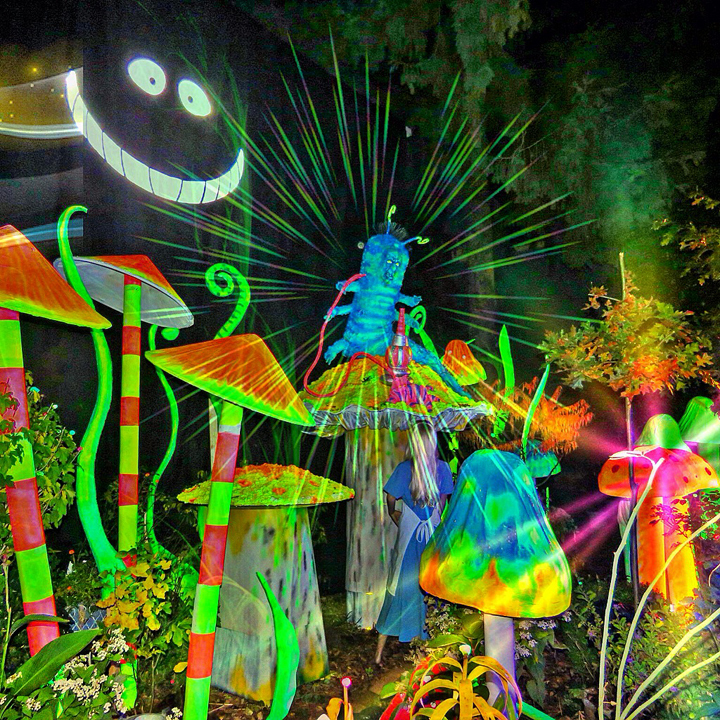 Alice in Wonderland on Thompson street is to be intact for another week, and I’m sure the adventurous traveler will be treated to the invasion from outer space at least until All Hallows Eve. I’m Rich Robinson, reporting for Weird NJ. “Here’s one from Madison. 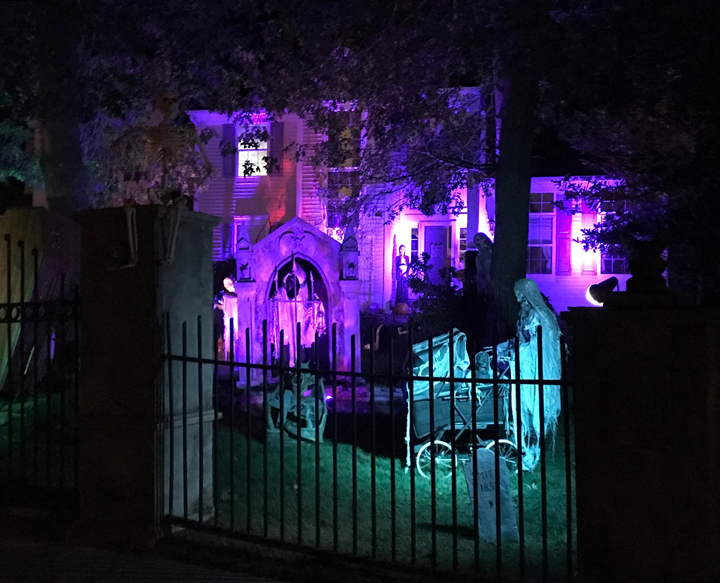 They do up their house in great style every year.” ~Karen P.
Haunted Hawthorne House Proves to be Just TOO Horrifying! “I’ve lived in Hawthorne for my entire life (I’m 52). 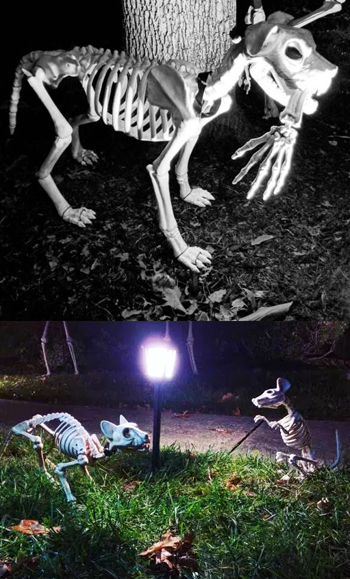 I always enjoyed his Halloween display. I don’t know why but as of yesterday, Oct 18th all the decorations were removed. I know over the years there were a few complaints about traffic and his displays were too graphic. 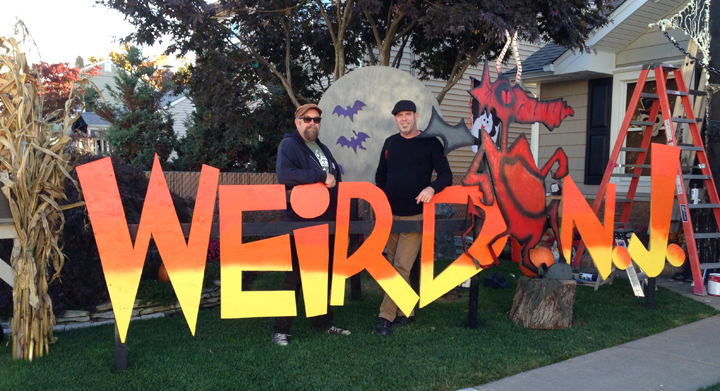 Look forward to every issue and special edition you put out.” –Wayne V.
2014: The Weirdest Halloween House in Jersey! 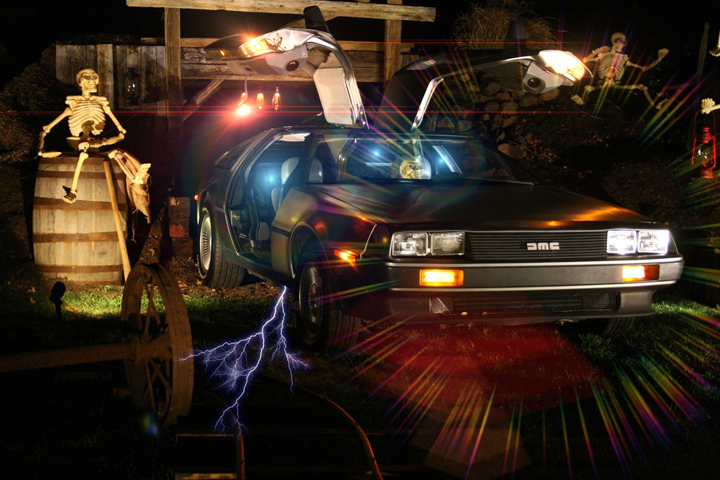 Want to get really weird this Halloween night? 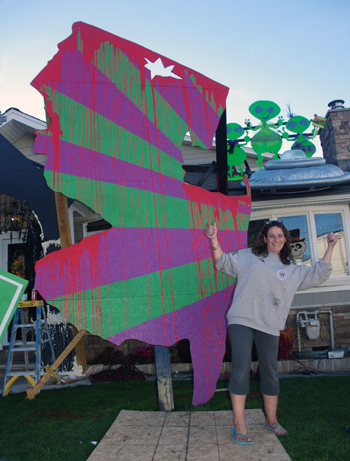 Go no further than to 102 Monroe Street in the Haskell section of Wanaque to see the Weird NJ creations of Kim-Marie Dakake. Kim-Marie and her husband Tom own a construction company called Accurate General Contractors, so materials are always ready-at-hand. The displays are cut freehand out of particle board, and made from whatever materials are lying around. 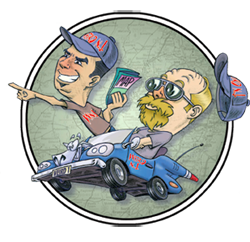 WNJ: The top of the roof has UFOs and aliens on it. Tell us about that. Wanaque has two local legends, one being the Wanaque Vortex and the other the UFO sightings over the reservoir. I’ve heard about the UFO incidents since my childhood. I grew up in Pompton Lakes and remember when I was young looking up towards the sky to see if I could see anything but never did. This is a tribute to the town I live in. Why is this the last year? It’s getting to be just too much. Usually I’ll make one prop then build around it, but this year it’s everything bigger than life! I love the essence of New Jersey. 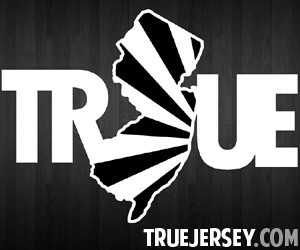 I also love True Jersey apparel, so I incorporated their logo on the shape of the state. I love our local legends. I love Taylor ham and cheese, the coffee and I love the way we talk! Is this open for all trick or treaters? Yes, it is. 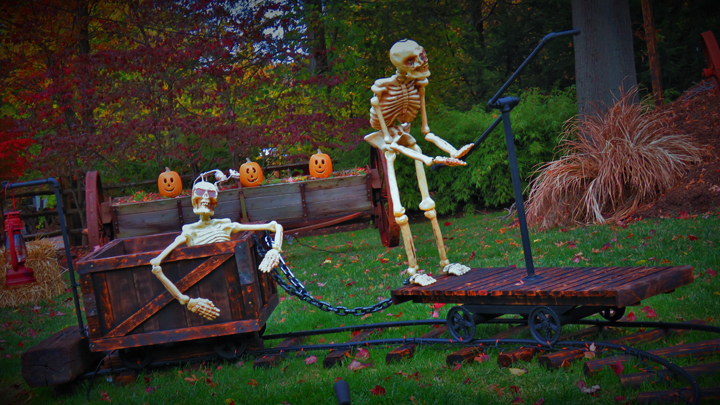 When we first moved here there was no Halloween traffic at all, so I decided to make displays to attract the kids. Now it’s grown into this. We get about 1,000 kids coming here on Halloween night. I’m known in town as the “Halloween Lady.” It’s all about the fun of it for the kids. 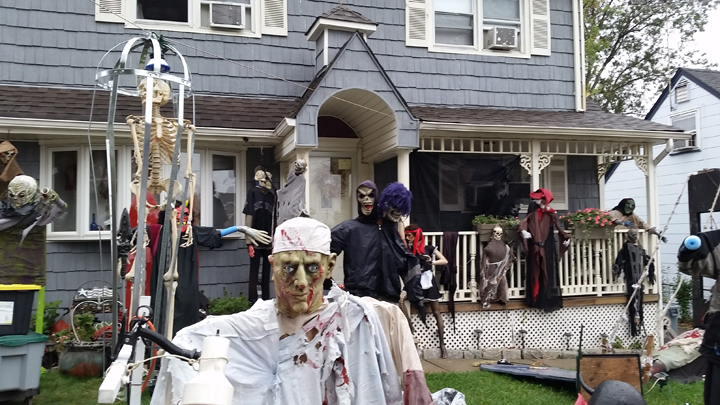 Now Halloween is huge on this block. Kids and traffic all over the place! Does it all get taken down the day after Halloween? It used to come down the next day, but this I’ll keep up for about a week. 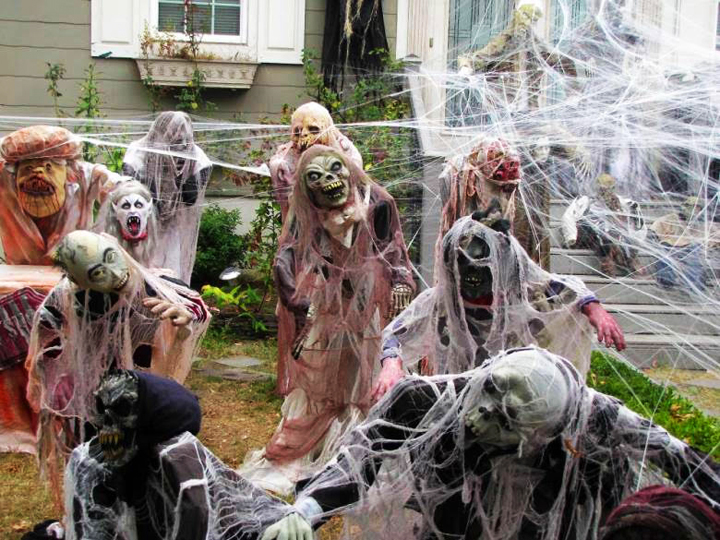 When Hurricane Sandy hit, the local kids didn’t get to trick or treat. 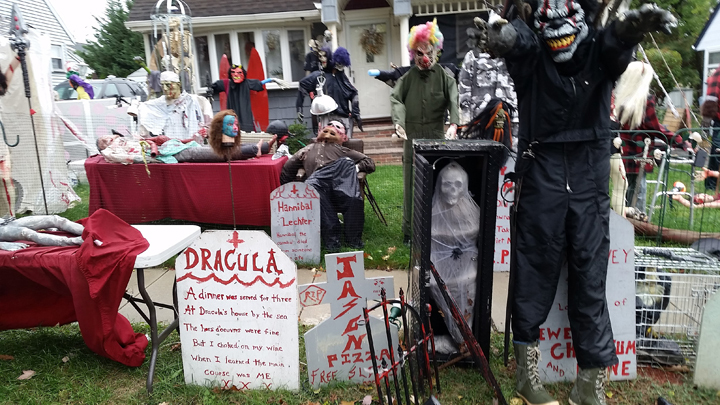 My display that year actually stayed up—no damage, so I kept it up for about 2 weeks and had about 6 other towns come here so all the kids could get candy. 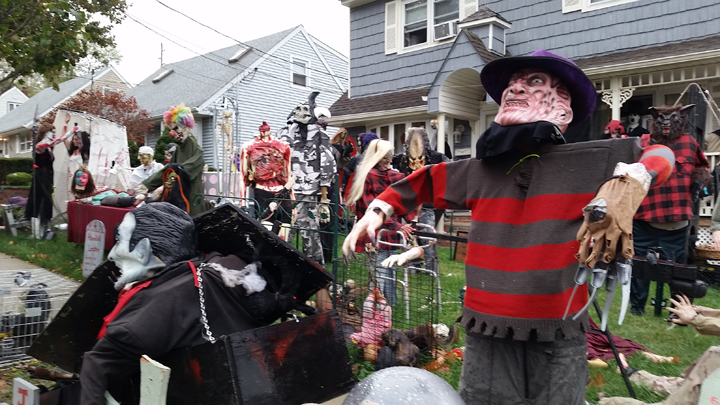 What happens to the displays once Halloween is gone? Aren’t you going to miss doing this? When we visited Kim-Marie on Monday, she and her husband Tom were still working on the “Vortex Walk to the Reservoir” and adding new displays and signs as they went along. 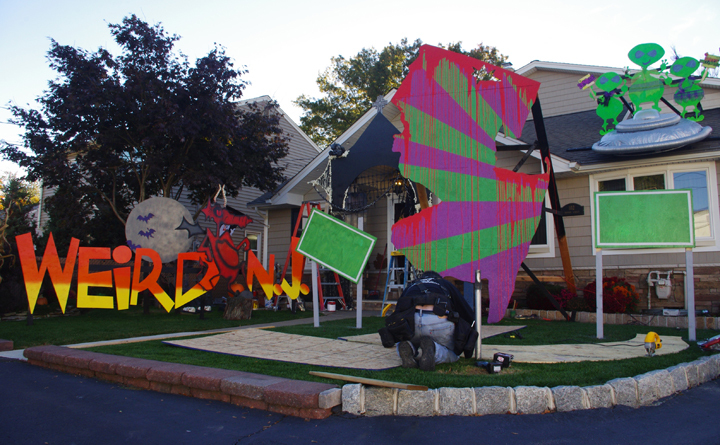 Who knows what frightful delights this Weird NJ menagerie will turn into Halloween night. People often ask us “What’s the weirdest thing you’ve even seen?” and for the moment, this is where it’s happening. 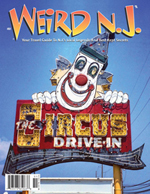 All stories and photos are the copyrighted property of Weird New Jersey, LLC., and may not be reproduced by any means without the written permission of Weird NJ. 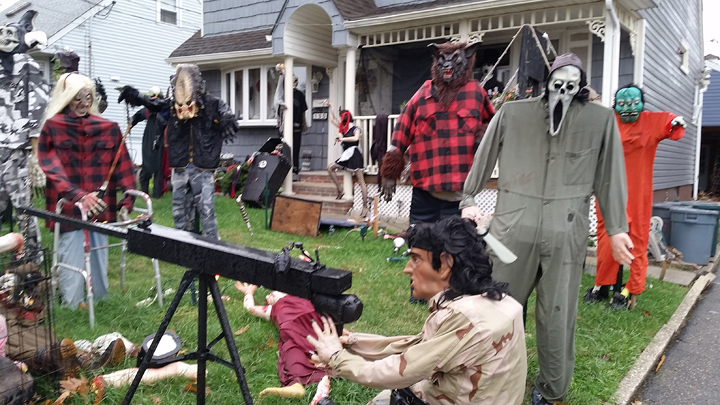 This entry was posted in Personalized Properties, Roadside Oddities and tagged Bordentown, bound brook, bridgewater, halloween, halloween display, Hawthorne, lawn displays, skeletons. Bookmark the permalink.